Have these questions ever crossed your mind? Is your job going to be around in the next 3-5 years? Will you suffer from a paycut in the next 3-5 years? How is your career option going to be like in the next 3-5 years? What kind of lifestyle do you like to have? Have you thought about what kind of business opportunity can allow you to live the lifestyle that you want? There have been many changes in the business world over the last few years – some of which resulting in people losing their jobs, people getting paycuts, cost of living increasing, shops closing down. Friends who have children and commitments are forced to supplement their full time jobs with part time jobs. It’s very common to hear about people who do freelance photography, give tuition, teach gym classes – just to get a second stream of income. Will it happen to you? If it does, what are you going to do? Allow me to share with you why choosing MLM can give you the future you want. MLM (multi-level marketing) has been around for a long time, more than 50 years. Some call it network marketing or direct selling. Why would a person choose to be in MLM? There’s a man by the name of Robert Kiyosaki, who wrote a book called Rich Dad Poor Dad. This book revolutionises many people’s perception about income generation – it advocates financial independence and the different ways of building wealth. It also highlights different attitudes towards money, work and life - the different types of mindset and different types of income stream that a person can generate. In particular, he introduces a concept called the Cashflow Quadrant in his book. Kiyosaki categorises the economic world into 4 quadrants - Employee, Self-employed, Business Owner and Investor. The E quadrant refers to Employees - people who trade in their Time to get an earned income. You may be the CEO of the company, or tea lady of that company. This group of people perceives a job as representing Security, because at the end of each month they will get a Paycheck. They earn income using their time. They value being part of a company because they know that every end of the month they will get paid, no matter what. This group of people makes up a majority of the economic world. But we know that is no longer true, because a job no longer guarantees security and a monthly income. The S quadrant refers to the Self-employed. This is the group of people who value Self-Independence. They want to become their own boss. They either open their own shops (restaurants, fashion outlets), or their own professional firms (dentists, lawyers, doctors). These bosses have to pay themselves last, after paying their staff and all other expenses first. Also, they have to be physically there in order to earn the income. E.g. if you’re a dentist and you’re not in your clinic, nobody can do the job. Only when you do the work, you’ll get paid. These people are constrained by Time. In the Business quadrant, the entrepreneurs or business owners don’t have to be physically there to run the business, e.g. Microsoft or franchises like McDonalds. The franchise owners don't have to be present at their outlets in order to earn income. They just need to employ the right people to work for them. And they also put in place a System that creates the income stream for them. The Business owners use what we call an Asset to generate the income for their business. This Asset can run perpetually even if they are no longer around. The I quadrant refers to Investment. The people in this quadrant use money to make more money, e.g. Warren Buffet. These people know how to make use of money to generate passive income. (a) you need capital to start either your business or your investment. (b) you need business knowhow and skills. For example, if you want to invest in properties or stocks, you need to know which property to buy and what type of shares to buy in order to generate a positive income stream. As for starting a new business, you need to have the knowhow. The Knowledge and Capital are 2 of the key things that have hindered a lot of people from venturing into both these quadrants. Further, the higher the capital, the higher the Risk. Because of that, even if you have accumulated a lot of savings in your account, you may still hesitate to start your own business. Not many people will take a big risk to start something they have no knowledge about, and take a big gamble with the money they have saved all their working life. The cost of Failure is too high. So then, what are the options for people who don’t have a lot of capital and not much of a knowhow in generating passive income? Take a look at the MLM business model. MLM is in the Business Quadrant, because MLM is about building assets and eventually generating passive income. In the Employee and Self-employed quadrants, You are the money making machine. The things you can do are limited, because you’re constrained by Time. You need to exchange your Time to earn Money. Only if you go to work, then you get paid. Only if you open your shop, then you can earn income. But for MLM, which is in the Business quadrant, you Own the money making machine. You free up your Time to do many things, even as you are on the way to achieving financial freedom. MLM is not a sales job. MLM is about building a Strong and Stable Network of business partners using or distributing quality products needed by people. The network that we’re building is our Asset. MLM is one of the best options to shift from E and S to the B quadrant smoothly with the least risk. MLM is meant for people who don’t have much capital and are not willing to take high risk but want to own a business and earn passive income. In essence, a genuine MLM business has very strong products behind its business model and it is about building a strong network, not merely selling. What is so Unique About MLM? MLM has a unique concept called Exponential Growth. This is how it works.. In the beginning when you start the business, it’s 1 person, just you. In the first year, you attract 5 friends to join you in the business. They do what you do – distributing the products and building networks. At end of Year 1, you have 6 people in your network. In year 2, your 5 friends will also attract 5 friends to do what they do. In total, 25 new people. At end of Year 2, you have a total of 31 people in your network. In Year 3, these 25 friends will bring in another 5 friends, meaning an additional 125 people. In total you have 156 people. In Year 4, by repeating the same thing, getting only 5 people, you have 781 people in your network. In Year 5, using the same method, you will have 3,906 people. In Year 6, you have a total of 19,531 people in your network, just by having 5 friends in a year to do what you do in the MLM business. So what does that translate to at exponential growth in terms of income? Let's say not all of the 19,531 people will continue up to 6 years with you. Assuming 50% will stay on with you and each person only buys RM200 of products, your monthly sales turnover is almost RM2 million. Based on a commission of 5%, your monthly income is already RM97,655 a month. 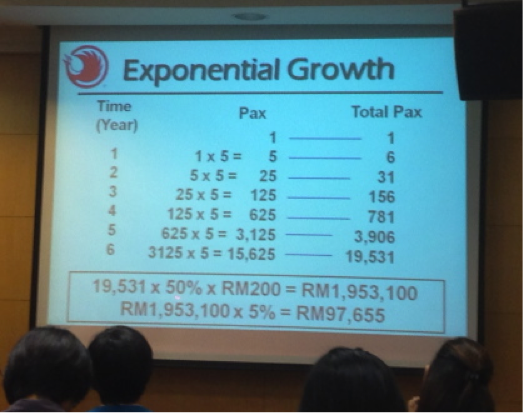 This is what Exponential Growth means and this is what a genuine MLM business can provide to you. There is no limitation to how much you can earn. The only limitation is how much of Time and Effort that you want to put in to have this group of people to be in your network. This scenario assumes 5 friends in a year who will come to do this business. But what if you have more than 5 friends? Your income will skyrocket even faster. This is what MLM can offer in terms of exponential growth in income. But that’s only on the Income side. What about the ROI (Return on Investment) for the effort and time that you put into this business? There’s not much capital that you need to put in to start this business. The key thing you need to invest is time and effort. The Blue Line is the Income Stream - as was explained in detail in the Exponential Growth slide. The Green Line is your Effort Line. In the beginning, there’s a big gap whereby you need to put in a lot of effort to learn what the business is about. We were never taught in school how to do this business. So when we start the business, there are a lot of things we need to learn. But as we start to learn, the effort goes down when we become more familiar with how to conduct the business and brush up on our product knowledge. The most exciting part is when you reach the Critical Point - the cross between your Effort Line and your Income Line. From this point on, you will start to earn Passive Income. This is what we’re all looking forward to when we involve ourselves in MLM - to enjoy Passive Income. But in the beginning, the effort is quite substantial. The time that you invest to learn and to build the network takes effort. So in the first 2 years, you have to do many activities like attending meetings, meeting a lot of people and putting in long hours, but your income for the month could be only RM150 for 20 hours of effort. You’ll be thinking – is this the right business or not? Don't worry, You’re on the right path. As you’re learning to do the business and building the network, your network needs time to reach that critical point but when you arrive there, and continue, you will get to enjoy the passive income. What are the benefits of MLM? 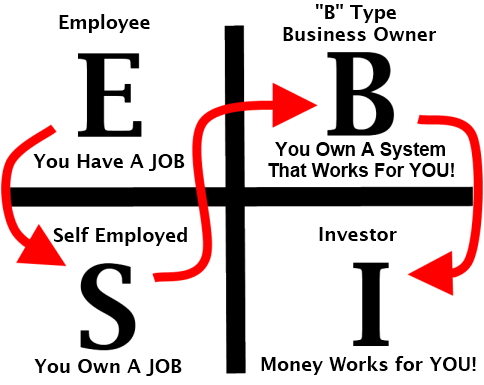 This 2 concepts have been illustrated in detail above. 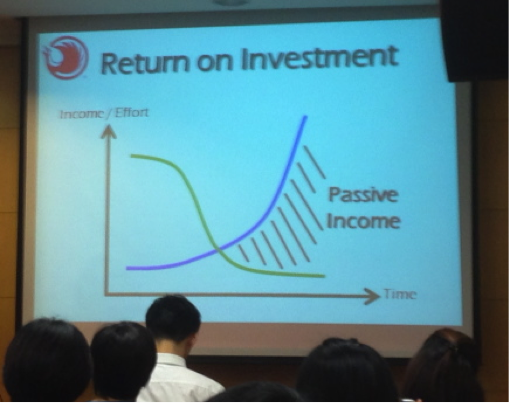 Because of the nature of having passive income, we can enjoy time freedom. There’re many people who can get financial freedom, but without having passive income, we can never get time freedom. This combination of Financial freedom + Time freedom is one of the key benefits of MLM. Not many business models can give these 2 benefits at the same time. We can start this business very easily by using our spare time, while keeping the full time job. So if you can start this off part timely, you can still have income from your full time job to pay your expenses while you start to build your Asset. All new businesses take time to grow. Not many businesses allow us to start on a part time basis, but MLM does. As MLM business doesn't require a lot of capital, the risk is also very minimal. If anybody were to come up to you and tell you to invest RM10,000, RM50,000 or RM100,000 to start an MLM business, those are probably not genuine MLM business. MLM is really meant for all to do. It’s meant to be very lean, with minimal capital needed to start the business off. It doesn't matter that you have no experience in this business, because there are mentors and coaches to guide you. For us to shift from the E and S quadrant, it’s not just shifting in terms of skills. It’s actually shifting in terms of Mindset and Attitude. The mindset and attitude can only be changed through the guidance of those successful people who have done the business. These are the people who will selflessly guide you to give you that smooth transition from that E and S quadrants to the B quadrant. It is a very fulfilling business, because this business is built upon the success of others. Only if you have the intention of bringing those 5 friends to build this business with you, only when you can retain them within your network to grow their business, then you will see the exponential growth. Therefore, you as a business owner will need to be the leader to help as many people as possible. That is why this business is really built upon the success of others. MLM is now a recognized industry. It is a mainstream business. A lot of books have been written on it. Robert Kiyosaki wrote a book called Rich Dad Poor Dad. He also wrote a book on the topic of MLM, called Business of the 21st Century. Randy Cage also wrote about this business in a book called How to Build a Multi Level Money Machine. 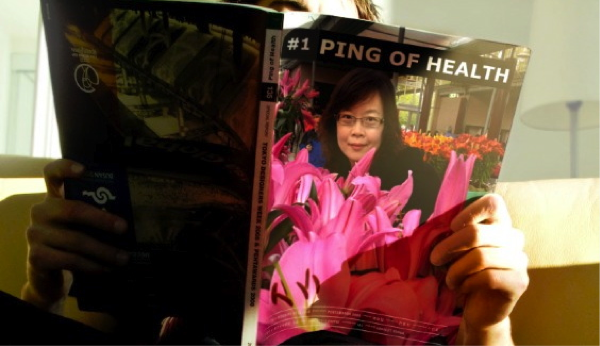 Our home grown author Lee Poh Eng wrote a book called Corporate Life to MLM. Why would a high flyer corporate manager sitting at such a senior position come to do MLM? Have a read and discover for yourself. Therefore, MLM is a preferred choice for people who want to lead an extraordinary life. What does extraordinary mean to you? You don’t have to wake up and face the jam to go to work every morning? You can tend to sick loved ones knowing you don’t have to go back to office for a conference call? You know that you can be with the people you love without worrying that you have to run back to the office to sign cheques? You want to go to spa on Wednesday afternoon? Or you can just go shopping at the time when everybody else is in the office working? Is that extraordinary to you? MLM is also for people who want to lead life meaningfully, with purpose, in contribution, be it for their family or community. Or people with bigger vision who want to do charity work, whereby they can contribute meaningfully in terms of finance or their time. Finally, MLM is a business that allows you to be in control of your own life. Time to a lot of people simply means 24 hours a day. But time is also our Life, if we allow that time to just slip by, it also means that our life and our youth will just slip by. So to be in control of your own life means you can be in control of the time you want to use with whoever you want. And to do whatever you want whenever you want. That is the control that I can have with MLM business. I hope my sharing has given you some insight on what MLM is and what MLM can offer you. I leave you with this question..
How would your career chart look like in the next 3 or 5 years? Will it look like the slide I showed you, whereby your effort will go down but your income will continue growing? Or will it be the other way round - when you're old, you still have to put in a lot of effort to look for money? If you don’t want your chart to look like that, start taking action now. 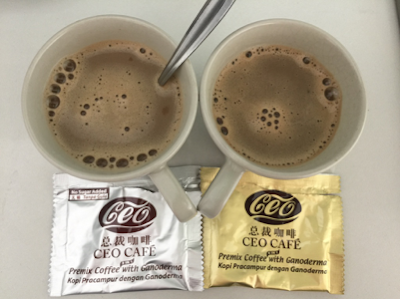 Email me at askfuiping@gmail.com if you want to come explore my MLM business - Shuang Hor Business.